Teen Wolf (MTV, Mondays 10 PM EST, Season 3 Premieres June 3rd): This teen werewolf series has done well-enough in the ratings that MTV considers it a success. Early on, it looked like it had the potential to become the next Buffy the Vampire Slayer, but instead it decided to coast closer to the Vampire Diaries-type angsty-teen melodrama angle. That works for its network, though, and this one should continue to pull decent enough ratings (around a 0.7 rating in the 18-49 demographic based on the overnights) to win it a fourth season. In the Flesh (BBC America, Thursdays 10 PM EST, Premieres June 6th): This British zombie series is likely looking to capitalize on the current popularity of AMC’s mega-hit The Walking Dead, though it offers its own twist with the zombies live amongst humans. The first season already aired over in the UK and a second season has been ordered there. Continuum (Syfy, Fridays 10 PM EST, Season 2 Premieres June 7th): This Canadian export time travel series kicks off its second season in the U.S. (which is already airing up north). Its numbers for Syfy weren’t great during its late-Winter/early-Spring run (usually pulling a 0.3 or 0.4 rating), but then I don’t know that it relies on those too much. I believe its performance in Canada and worldwide will have a bigger influence on whether it gets a third season. Sinbad (Syfy, Saturdays 9 PM EST, Premieres June 8th): This British made retelling of the Sinbad legend has already been cancelled overseas, though apparently Syfy decided to pick up the twelve episodes produced to pad out their schedule with alleged “original” programming. Primeval: New World (Syfy, Saturdays 10 PM EST, Premieres June 8th): Another cast-off, this Canadian spin-off of the British Primeval series was already cancelled up north. So along with the network rejects (see below), we can call Summer Saturdays Sci Fi Burn-Off Night. Falling Skies (TNT, Airs Sundays 9 PM EST, Season 3 Premiers June 9th): This alien-invasion series had a lot of sci fi fans grumbling about it through its first and second seasons, but it still ranks as TNT’s highest rated original drama. Plus, they are already prepping for Season 4, so unless it has a major drop-off in the Nielsens, expect it to return again next Summer. True Blood (HBO, Airs Sundays 9 PM EST, Season 6 Premieres June 16th): This vampire melodrama may be getting long in the tooth (though I thought Season 5 had its moments), but it still draws a big audience over to pay channel HBO. Consider it a lock to come back for a seventh season. 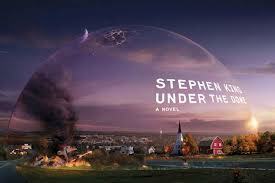 Under the Dome (CBS, Airs Mondays 10 PM EST, Premieres June 24th): CBS typically won’t touch sci fi shows during the regular season (unless they are heavily disguised as procedurals like Person of Interest), but they are giving this genre entry a chance in Summer. It’s based on the book of the same name by Stephen King and this is the show I am most looking forward to in the coming months. With King’s name attached it could actually draw a decent audience and it doesn’t have to pull huge numbers in Summer to be considered a success. It’s designed as a mini-series, but they’ve also built in a plan for a continuation if it does well. I give it slightly higher than average odds of succeeding, though it would probably have a better chance on one of the cable networks. Futurama (Comedy Central, Airs Wednesdays 10:30 PM EST, Season 7.5 Premieres in June): This animated sci fi comedy returns to air out the second half of its seventh season at some point in June, but then that’s it. Comedy Central has announced the will not be continuing it beyond that. I hear there is a fan movement to get it moved to another network, though, so the story may not be over yet. Siberia (NBC, Airs Mondays 10 PM EST, Premieres July 1st): The details on this show about a reality series gone wrong are still a bit sketchy, but it sounds like it could have some horror/sci fi elements as part of its premise. Sounds interesting, but the lack of promotion makes it seem more like a cast-off show. I’ll tune in to check it out, but I don’t expect an extended run from this one. Being Human (BBC America, Airs Saturdays 10 PM EST, Season 5 Premieres July 13th): This will be the last season for the BBC incarnation of this show (does that spell an end to Syfy’s version as well? ), and it seems appropriate that it will air on the Summer’s Sci Fi Burn-Off Night. Network Burn-Off Shows: The broadcast networks cancelled several genre shows this last season and most will get their burn-off runs on Saturdays this Summer such as 666 Park Ave (ABC), Do No Harm (NBC), and Zero Hour (ABC). The CW’s Cult will air out its episodes on Fridays, though. Check the schedule at this link for times and premiere dates, and don’t expect that any of these shows will make enough ratings noise in the hot months for their networks to reverse their cancellation decisions.